Laurel Clark Designs presents a range of unique designer jewelry for women of fashion and individuality. 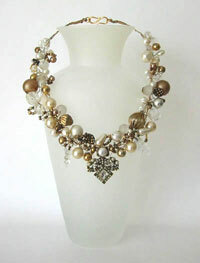 These designer necklaces are sensational and striking and can be worn with everything from jeans to haute couture. They are one-of-a-kind creations, fashioned from an eclectic mix of Venetian hand-blown glass beads, Swarovski Crystal, semi-precious stones, and a myriad of vintage European and Asian glass and Lucite baubles. These vintage and contemporary beads have been gathered from sources in Paris, London, Venice, Rome, and New York. The combinations of colors and textures are a delight to the eye, and the overall effect brings this costume jewelry into a new realm. Custom designed necklaces can be commissioned to match the fashion or fabric of your choice, and I am delighted to cater to any fashion designer to complement the most outrageous catwalk extravagances. Bridal designs are also undertaken. These original necklaces are guaranteed to stimulate the imagination and inspire style creativity. Earrings can be handcrafted to match any necklace. The versatility of this handmade designer costume jewelry transcends formal and casual, young and old. These are exciting accessories for exciting individuals. No two can ever be exactly alike  they are individual wire sculptures, wearable art. Prices shown are my retail prices. Please contact me for wholesale terms or dicounted Direct-Buy prices for individuals purchasing directly from this website. Though many of the necklaces shown are marked as "sold", I work primarily to order and will recreate color schemes and styles to be sent on approval. Please see my "Sold Gallery" pages as well for hundreds more ideas! And don't forget to check out the "Ultimate" Collection section. For current news, please visit my Facebook Business Page for Laurel Clark Designs.